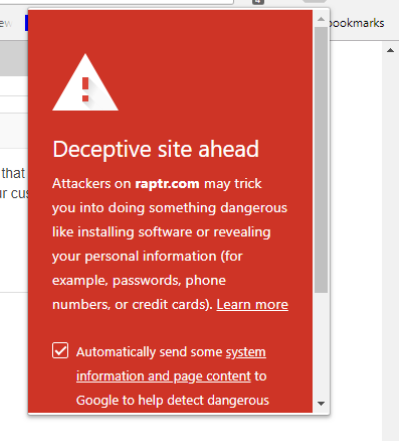 When trying to use the button at the top of chrome to get to my saved passwords, I keep getting a warning saying deceptive site ahead instead of it showing the list of my passwords. Also when I start to search my vault when the tab is open it shows the same thing and it gives the option to go back to safety and when i click on that, it takes me to a new tab at google instead of back to the vault. Any idea why it is doing this? UPDATE: I closed out Chrome and reopened it and went into my vault and found the raptr.com login I had saved and deleted it and that seems to have fixed the problem I have no idea why it started doing that because it worked fine earlier this morning. Anyway, if someone else has this problem maybe this may help them out. Um, your pic looks like information from Google Safe Browsing / Chrome. I use to use Raptr because of one of the games I use to play, but it has been a couple of years since i even had that game on my computer. I have no clue why it was giving me that info since I wasn't even trying to go there. I was wanting to go to my insurance home page and usually go to my vault and click on the log in for the site and it takes me there. Just as soon as i would click on the vault button on my chrome, it would give me that message. If I tried to search using the vault that opens in the tab when you first open it, it would also give me that message as soon as i typed the first letter. But since I was able to get the Raptr log in deleted, it hasn't happened again. I just started getting this too. What's strange is that I can click the Google App icon and it takes me to the NIE homepage, but if I click on the search bar the block screen pops up. I had to scroll down to the raptr login to delete it, now NIE works fine.